What’s that you say? No, I’m not rallying to rename that terribly pesky insect we all know too well, nor am I ripping off a Skippyjon Jones book (for those of you who’ve had young kids in the last several years.) This is the story of my ketogenic diet experiment while maintaining my usual pescatarian lifestyle. Pescatarians do not eat other meat, just fish and seafood. That’s been me for quite some time. For a handful of personal reasons. So when I embarked on this experiment for fun, I wasn’t willing to compromise the animal protein aspect of my diet which made it more interesting...and more expensive! The ketogenic diet, or keto, as I shall forever after here refer to it as, found itself historically used to treat children with epilepsy--like we’re talking since the 1920’s here (anyone remember Lorenzo’s Oil? Similar concept.) In the last few months, keto kept sweeping across my radar--for some reason it repeatedly cropped up, probably because it has bloomed into another hyped up, quick, let’s get some products on the shelves type of fame, and potentially because once you read an article online, suddenly you are flooded with similar texts as the oracle (aka Google) creepily does. But also, I listen to the colorful CrossFit.com podcasts, mostly on long bike rides, because they are insanely long, just as this blog entry is about to be, and those guys pointed me towards the documentary Magic Pill, which is based on following several people through many weeks of a strict keto diet. The sum of these piqued my interest--so many claims, I wanted to check it out firsthand. I typically eat fairly cleanly, but by the ending of summer I definitely was ready to evict the tater tots and nachos from my diet for at least a month--so I set out to go pescaketo for four weeks. Phase one, I bounced back and forth between Andy’s Market and Huckleberry’s at Super 1 to acquire some keto basics. Why? Because keto is high fat, medium protein and looooow carbs. I used the: Total Keto Diet App to track. It rated highly of all of the free ones available. The app set my macros, after checking on my weight, bmi, fitness level, etc. to 140 grams of fat, 95 grams of protein and 25 net carbs. This means the carbs are calculated by subtracting the carbs from fiber from the total carbs and they don’t count against you. But 25...my favorite pre-workout bars have more than that in one little package. So quite a bit of my pantry and refrigerator had to be set aside for awhile. I stocked up on my oils: coconut, avocado, olive and some specially ordered from Bulletproof Coffee. Add to that, lots of avocados and nuts (but not cashews, my favorite; too many carbs), eggs and heavy whipping cream, loads of fish and shrimp, butter and more butter. Gone was the fruit, except for berries, many of the sweeter veggies, mostly just the dark green and leafy and cauliflower. Some nut flour. Full fat cheeses and olives. The easy side of keto for me is that sweets don’t call my name most of the time, but I did invest in some Stevia products and a sweetener called Swerve. I started every day with a dose of Bulletproof coffee (coffee blended with ghee and coconut oil or Brain Octane Oil as pictured above.) They warn you to go easy on the Brain Octane Oil as it is a super concentrated oil made from MCT or medium chain triglycerides. Hitting your body with a high dose of these when not adjusted can lead to some extra bathroom visits. For me, I found that I couldn’t drink my coffee before my morning workout like I normally do because it quickly gave me a stomach ache. The why behind the oil is basically that it is supposed to fill in some of the nutritional gaps in the keto diet and send quick energy to the brain. I now am definitely a fan of Bulletproof Coffee and found that my one cup in the morning carried me through the day and I cut out an additional dose of caffeine in the afternoon that I’d grown accustomed to. Breakfast beyond the coffee included eggs in some form, a hit of cheese and a half of an avocado. Sometimes a dollop of homemade mayo. Oh yeah...homemade mayonnaise. I’m never going back. Incredibly easy to make and so tasty: avocado oil mayo. Throw an egg in the Cuisinart, let it get to room temperature, add a shot of fresh lemon juice, yellow mustard and salt. Very slowly drizzle in a cup of avocado oil while mixing. It takes five minutes and is divine. If you don’t like mayo, well, I don’t quite understand you and we probably won’t be close friends, but that’s okay. A couple more eggs, avocado, grilled shrimp or salmon in a heap of butter or oil, mushrooms sauteed in more butter or oil, some mayo on the side, a mound of sprouts or kale or spinach. Luckily I’m not a wine or beer drinker, so if it was the weekend I could still have a bit of my favorite libations on the rocks--I tried a few rounds of Stevia mixers too, but I have discovered that no matter how much I want to enjoy Stevia, I just don’t. It’s sickeningly sweet to me in even the slightest amounts and has this off flavor that some describe as tinny, but I mostly just think of as overpoweringly sweet. After the first couple of days staying true to under 25 grams of carbs, the most noticeable benefit was the relief of any amount of bloatedness--the gluten belly. Like my shorts instantly felt looser. I also didn’t get very hungry--eating a high fat diet leaves you feeling quite satisfied most of the time. My energy felt fine, workouts stayed solid, no other big changes except I was constantly thirsty (as I’d been warned by the literature) with a drought infested mouth--oh so dry. I was anticipating the keto flu (as the body transitions from burning sugar to burning fat) to strike at anytime, but by day four I still felt fine. Almost euphoric, to tell the truth. Like a low level chronic high in which my brain seemed really in tune with its surroundings at all times. Kind of fun, all in all. I was supplementing fish oil and higher doses of magnesium than usual, using plenty of salt--the word was that these would stave off the flu symptoms. So as I slid into the end of day four of euphoria, I was surprised to find out that everyone in the world hated me. Every single person. The weight of all of the plights of the universe came crashing down and I found myself heave sobbing for several hours into the night, talking to a close friend on the phone who later, yes, revealed that he couldn’t figure out what happened to his stable, even, rational Genie. And low and behold, it turned out I may have turned into an emotional wreck for the night as all of the carbohydrates finally dried up in me and I hit the lowest of low. Seriously--I feel extra sorry now for folks who struggle with lows from either PMS or blood sugar ups and downs. The lucky usual me has neither, so to be smacked with this unfamiliar wave really threw me. After a day or two, I swung back up to emotionally even. Meanwhile, I supplemented a bit more with some Nuun tabs to get the potassium I was lacking. A little over a week in, at the box, we had a death-by-burpee workout. I distinctly remember this being the first time I noticed a lull in my workout--and it came as a combo package. My body didn’t have the same get-up-and-go, but most strangely for me, was that my brain function had dropped. Because if you know me, you know I’m not too keen on backing off or easing up. But here I was, facing round 14 and my head talked my body into chilling out. Calling it good enough for the day. And after a few minutes of recovery, let me tell you, if my body could have walked away from my brain, it would have. And for the next week I typically showed small amounts of ketosis success or light pink on the strip. The idea here was to get to a darker shade and stay in a state ketosis. Eagerly I anticipated this success. The claims being that I’d be burning fat for energy as my body adjusted, and that my brain function would be amazing and my workouts kicked into overdrive. Sweet--I was ready to experience Turbo Genie. Now, keep in mind that I also was starting to experience a build up of insomnia nights. I typically find myself experiencing insomnia every several days, par for the post 40 single mom course...but now--the nights were stacking up, all in a row. And that abdomen pain? Well, it kept coming on stronger and I started to Google all of my feared options: gallstones? Kidney stones? Exploding spleen? Appendectomy in my future? Until all signs pointed to that one dreaded one: constipation. For you see, I am a real regular gal in that department. And yeah, I’d noticed the frequency shift over the two weeks--but it made sense--no extra fiber and carbs, no extra visits to the bathroom. I upped my veggies as most I could, increased water even more, even though I was drinking about a gallon more a day already than my usual. 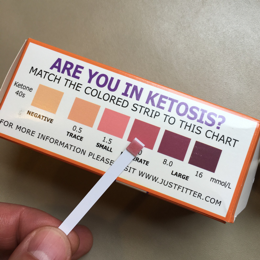 The test strips showed that I was indeed in full ketosis, and I read a bunch of concurring opinions that once you hit that point you could up your carbs to 50 or so and your body would stay there. This sounded like a good idea to me, for all of the uncomfortable reasons. In general I’d say I was just feeling overall yucky too. Consuming so much fat was fun at first--butter, yay! Extra mayo, yay! But over two weeks in I felt like puking when I sat down to my high fat breakfast in the morning. I grabbed some paleo granola that still fit into the macro count and alternated that with a shot of heavy whipping cream in it to offset the feeling, but still often felt like my stomach was up in my chest, ready to toss back the oily coating inside of me. And my workouts now...ha! At least I could laugh at them at this point--my runs felt so sloggy, like every moment was mile 17 of a marathon. My lifts felt so weak--like most days I’d double check the barbell to make sure Shane hadn’t slipped the 45 pounder in there for fun. For the most part, my brain felt relatively normal--still no extra special super power feeling though. I was also now back at work after summer, which always is a tough shift and I feel extra tired when first turning teacher mode back on--but this overall tired and gross feeling kept hanging out with me. I’d tried a bunch of recipes for keto baked things that involved substituted ingredients--the Swerve sweetener, which tastes like the fake sweetener it is. I’ve always detested the sickening chemical taste of those things. I’d tried using coconut flour recipes--some were decent, some tasted like wood shavings. The thing I always start to question in these nutritional situations is this: if you have to work so hard and be so inventive and use strange substitutes that may or may not be “healthier,” for you, it seems you are straying from the original purpose. For example, if you are vegetarian and eat tons of processed soy filler and products with fifteen chemicals in there--how can that be a better mission than eating clean, local meats and seafood? I don’t eat hot dogs, but I also don’t eat pretend hot dogs--they both don’t fall under the category of “real food,” for me. So I felt like this trend was happening in the keto world too--how to trick yourself into feeling like you were enjoying something that was a substitute for what you wish you were indulging in. And my abdomen kept cramping. And I wasn’t sleeping--and managing the behavior of at-risk teens plus my own young children on days without much sleep is about as fun as a week of double-under workouts. And I knew that this wasn’t going to be my permanent lifestyle--I’d entertained the thought early on, that if this went well and I felt like a rock star, why not keep it up? But I didn’t feel like a rock star. I didn’t feel like Turbo Genie. And I just didn’t feel very good. Labor day weekend came and I was faced with my fantasy football friends in town to draft and hang with as well as more friends staying with me. Tempting treats on every counter, lots of yummy carbs everywhere. And what actually broke me? A bowl of cantaloupe. I’d chopped it up for my kids and houseguests while fixing a big breakfast spread for all. And my brain cracked. I wolfed down oodles of fresh Hermiston melon, sweet and juicy. Was I really going to hit the end of summer and abstain from all of the amazing local produce available? No, no I was not. And so, my pescaketo experiment came to an end a week early--three solid weeks, a week shy of my goal. And I’m not one who likes to give up on my own goals, but this one I forgave myself for very quickly, for when that night (the cantaloupe was not the sole culprit of my carb binge that day) came I slept so hard--the first solid sleep in weeks--I was out cold and woke up bright and shiny, like I’d crawled out of my hibernation cave. And that Monday was a hero wod at the box for Labor Day. It was crazy how quickly the carbs kicked in--I had limitless energy that day--deadlifts unbroken, joyful, bouncy box jumps and a that feeling of my body and brain syncing up to keep me in the moment and locked into the workout. By no means does my conclusion need be advice for anyone else. I’m sure that many people are out there experiencing wonderful keto results. Good for them. I applaud them. I wish them well. In fact I toast them with my margarita glass and I’d offer them some chips and salsa, but darn it, they can’t have them. So I guess I’ll keep them all for myself.